A four-year-old boy who was reported missing was pulled from a river with life-threatening injuries, police said. 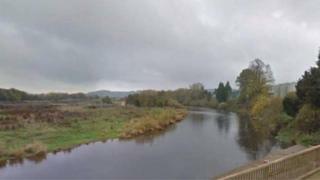 The boy was airlifted to hospital, where he remains in a serious condition, after being taken from the River Wye in Hereford shortly after 10:00 GMT on Thursday. He had been treated at the scene near Outfall Works Road in Rotherwas immediately after he was found. Police said the incident was not being treated as a criminal investigation. Supt Sue Thomas, from West Mercia Police, said "concerns" were aired to police about the missing boy on Thursday morning, before he was rescued from the river "shortly after". Paramedics gave the boy advanced life support at the scene before he was flown to Hereford Hospital by air ambulance. "This is a terribly tragic incident and our thoughts are with the little boy and his family at this time," Supt Thomas said.